Training-Online.eu provides free SSL certificate for all subdomains that are placed on our domain. 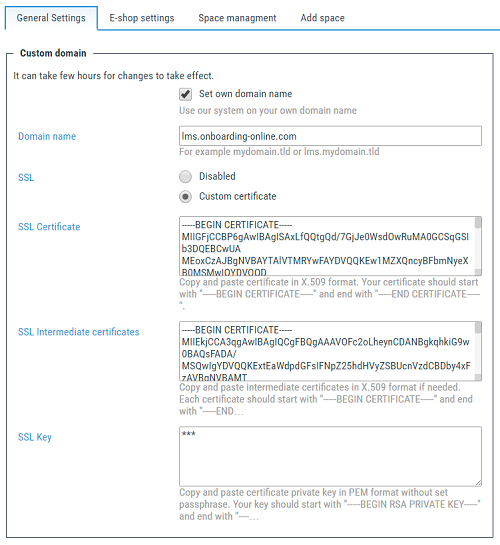 When you have decided to use your own domain name and want to have a full SSL security, you have to provide your own domain name and your own SSL certificate details. For your own domain, you need to provide valid certificate and keep its validity. There is a set of control checks when uploading the certificate and in case there is some information not correct, the certificate will not be applied. Edited 2 time(s). Last edit at 04/13/2017 07:43PM by admin_admin.